This was the final question I (Bill) was asked Saturday afternoon at the Sandusky (OH) Library, after my presentation on “Terrorizing Immigrants and Catholics: The Ohio KKK in the 1920s.” Sponsored by the Ohio Humanities Council, this address was part of the Sandusky Library’s series on the “Legacy of Race and Ethnicity in Ohio.” 56 people were in attendance, and they were quite lively, asking twenty-odd questions at the end of the presentation. And the conversation went far beyond the Second Ku Klux Klan, with much discussion of the ways in which violence and the threat of violence has been used to buttress white supremacy in the United States for the past 400 years. That we were in Sandusky made this conversation particularly interesting. In antebellum America this town on the shores of Lake Erie was an important final stop on the Underground Railroad, a place where fugitive slaves – if they could avoid the slave-catchers that often lurked about the port – boarded boats for Canada. Not only did Harriet Beecher Stowe feature Sandusky as the gateway to freedom in Uncle Tom’s Cabin, but a shorefront park commemorating the Underground Railroad was dedicated in 2007. Sculpture at Facer Park, Sandusky, Ohio. Image courtesy of Erie County Historical Society. 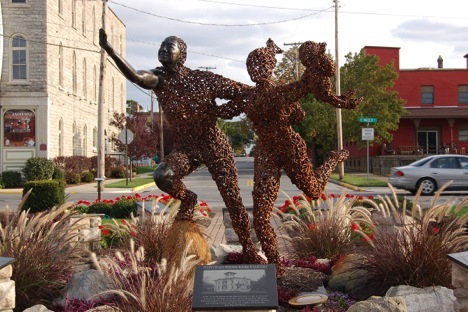 Notwithstanding the town’s illustrious antislavery history, on September 4, 1878 William Taylor – a black man accused of murdering a white woman – was taken from sheriff’s custody by a mob of thousands and dragged through the streets of Sandusky while the crowd kicked and beat him. While Taylor continued to plead his innocence, the crowd tied a rope around his neck and hung him from a downtown lamppost. Nations reel and stagger on their way; they make hideous mistakes; they commit frightful wrongs; they do great and beautiful things . . . And shall we not best guide humanity by telling the truth about all this, so far as the truth is ascertainable?